Mary O'Neil attended school near her home in Bathurst Street and later both mother and daughter both worked as domestic servants . She told me she met Percy for the first time whilst walking home from her Aunt’s house at the bottom of Bath St. Sandy Bay She was then living in Bathurst St. and he lived in Melville St until 1902 and then his family moved to Sandy Bay. So this meeting probably took place in 1905. They were married at St. David’s Cathedral on 3 Jul 1907. Perhaps they first lived with her mother but Percy and May set up their first home at 8 Queen St Sandy Bay. The electoral roll for 1909 records them at that address with his occupation as labourer. His parents and elder brother Bill lived nearby. Around 1911 they moved to 39 High St. Sandy Bay, on the left of what is now Sandy Bay Rd. between King and Princes St. After a few months they moved across the road to number 32 (later renumbered 34) which was two houses up from the corner of Gregory St. In 1915 Percy’s elder brother Bill and his family lived at this address) Their first son, Keith Herbert Jack, was born in January 1910, Lionel was born in February 1912. It seems that he continued to work with his father until he enlisted in the Hobart fire brigade in July 1911. His uncle Flurance had been a member of the brigade since 1898. He resigned in 1914 and bought a touring car his driver’s licence, number 4452, was issued on the 13 Oct 1914. He did not operate the car for long but long enough to run foul of the traffic regulations on one occasion. Mary renewed the licence on 15 Sept the next year. But by this time he and his older brother William had followed their younger brother Claude into the AIF. 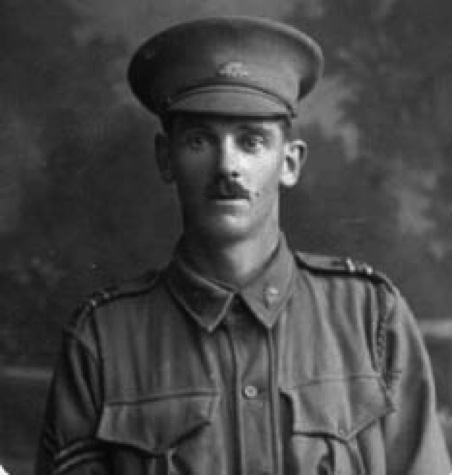 The third son Douglas was still a baby when the 28 years old Percy joined the AIF on 21 July 1915. He and William signed up on the same day. Claude had now spent almost two months on Gallipoli having landed with the 12th Batallion on the first day. It seems logical that Percy delayed his enlistment whilst May was pregnant so the War was almost a year old when he moved into Claremont Camp and was formally enlisted on 15 July. The medical officer recorded that he was 5 ft. 8 ins. tall and weighed 10 stone 7 lbs. Of dark complexion, brown eyes and brown-black hair. 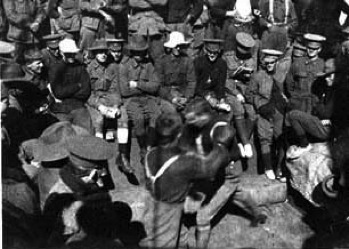 After a short training he and Bill left for overseas on the Ballarat on 8 September 1915 with the 5th AIF Reinforcements. They arrived in Egypt and Percy settled in to training at the camp at Heliopolis near Cairo and life in a very foreign land. He was a diligent correspondent but no Mark Twain. Percy, and Bill, were assigned to the 26th Battalion that was made up of soldiers from Queensland and Tasmania and formed part of the 7th Brigade of the 2nd Division. He took with him a Box Brownie camera and made a photographic record of the voyage; unfortunately the camera was stolen before he arrived in Egypt. Percy had spent almost two years in the Derwent Regiment before being discharged for being inefficient. Despite the discharge his experience was enough to ensure that was promoted to acting Corporal less than two months after his enlistment and Mary's allowance rose to 6 shillings a day. Their first port of call was Adelaide and the brothers explored the town, photographed the sites and sent post cards home. Just a note Hoping that you are well as this leaves Bill & myself this is a fine place the prettiest little town that you ever seen gardens everywhere we are leaving tomorrow Tuesday not staying anywhere I will send you some snapshots photo and then send them to the Tasmania Mail. Hoping the kiddies are well. 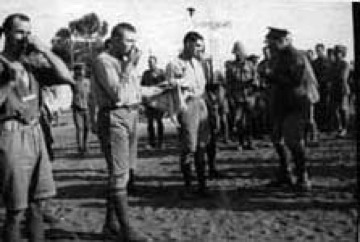 The reinforcements arrived in Egypt and Percy settled in to training at the camp at Heliopolis near Cairo and life in a very foreign land. He was a diligent correspondent but no Mark Twain. Poor May got little news and few expressions of affection. The first card was addressed to Keith and written on 15 October 1915. Just a line to you hoping you are well as this leaves Dad I will fetch you home a little turkey man to play with. Just a line to let you know that I am well hoping that you & all are the same. I arrived here alright Bill is well. I have not seen Claude & I don't suppose that I will. I think he is at the front in the trenches we will be here for a month or six weeks as much as we know. I met Claude Clarke he came in the troopship that got here the same time as we did. This is a very hot place. They don't use English money you have to change it for Egyptian money. I am going to send you a silk scarf so look out for it. There is nearly all black Egyptian people & a few French here this is the to see life you do not know that you are alive till you see the sights of Cairo. Tell Fred to Enlist he will not regret it. I have met a few Tassy Boys knocking around some are here wounded they are all wanting to get back to have a go again. I had my Camera stolen on the ship I will not get another. A chap told me that he was in the hospital with Claude and that he was shot in the toes the big one & the next one. Well old Girl I think that I have told you all this time I will write you a long letter later, so buck up it won't be long before I am coming home again. Kiss the boys for me & one for yourself. As his brothers set off for the Middle East unbeknown to them Claude had left Gallipoli. After a month in the trenches he fell ill with colitis and soon found himself on the Hospital Ship Valdivia bound for Mudros and then Malta. In St Andrews Hospital he was found to be so ill that he needed treatment in England. On 15 September he was transferred to the HS Devon Castle and eight days later was in the Military Hospital at Fulham in South London. Christmas came and a flurry of cards followed revealing some loneliness and, following the defeat at Gallipoli with the realisation that the War would not be over quickly. Percy discovered that Claude was in England. Just a few P Cards of Egypt & a Xmas Card that the Red Cross people kindly gave us with cigars & cigarettes & tobacco & cards. I am well also Bill but we are separated he is in a different Battalion to me. I hope that you are well also the children and Mollie & Jack & your mother and all are in the best of health. I am not getting any letters lately I don't know where they can be going to. Everyone is getting letters but me. Well Dear I hope that you have all had a good Xmas and will have a happy New Year and I hope that this war will be over and I will be home again to you and the dear children, I do miss them, but I hope it won't be long before I get home again. I have written to Claude to England but I have got no reply yet. the Prosses have arrived. I seen Harry Pross, he told me he was down Sandy Bay to see Mrs S before he left and he was talking to May. I expect she is having a great time, Bill being away. And, you know the Swifts that used to be the plumber in Sandy Bay, up round the back of the Bay, they are both here, Father & Son. Well dear I have had a very quite Xmas and New Year Day is like any other day, no holidays here. But May Dear, I hope that you will not worry about me as I am alright, so far, and I promise to take care of myself. Don't stop in too, much go out and enjoy yourself as much as you can. Take the Kiddies on to the beach. I seen a photo in the Mail that one of the boys had on Long Beach I had a good look for mine among the crowd but it was Show time, about October. I expect that it was pretty cold for the beach about then. How is Mr Hurt getting on at Long Beach? I expect he is doing well I would have been allright with the visitors if I was home there. I often send him a line, I must drop him a card, he is a fine chap. We do not get much war news here only from old papers but the Germans must be getting heaps now as things are going so easy. ... They have some fine cars here that only cost £300 they sell for £50 in Australia. Tell Jack that George King is here that used to drive for Cane & Co.
Claude had recovered his health and sent his father and May a card from London for New Year 1916 that suggests that he had not received Percy’s letter and did not know his brothers had arrived in Egypt. In mid January Percy got severe tonsillitis and was sent to the No.1 Auxiliary Hospital and a week or so later transferred to The Helouan Hotel Sanatorium at Al Hayat to recuperate. A few lines to you hoping that you are all well. Well Dear this is a photo of the place that I am at and I am getting better and will be back with my regiment in a few days. It is very quite here but it is Just the place for anyone to get well. You can see by the picture what a fine place it is. It is a big Hotel the name is Hotel al Hayat it is a tourist resort in peacetime well. Well Dear I have not got any mail for over a month now I have not seen Claude yet but I am expecting him to come out today. That is if he can get leave; he is about 100 miles from here. Early in January 1916 Claude was well enough to return to the War. 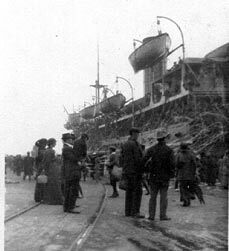 He disembarked from the Oriana in Alexandria on the 13th and rejoined his unit at Tel-el-Kebir. There he discovered that he had been promoted to Lance Corporal. A few more lines hoping you and all are well as this leaves us also to tell you that I have not got any letters from you for about 4 or 5 weeks. I don't know what they are doing with my mail at all. Well Dear I seen a Xmas number of the Courier today and there was a photo of dear old Hobart in it and it make me long to be back home again. Well dear it is no use of longing we must trust to luck and we have been lucky so far none of our chaps that came with us has been killed but some have been wounded. One poor chap named Cross that comes from Irish Town near Port Cygnet got his leg blown off with shrapnel at the knee. He has been sent straight home; he ought to be in Hobart by now. He had bad luck from the time we left; he had the measles for 4 weeks on the boat coming over with us. Well dear this is all. By the end of January Perce had recovered and returned to his unit but ten days later he is back in the casualty clearing station with influenza. A few lines to you hoping you are well as this leaves me. Well Dear. I am leaving here tomorrow for my unit again. I go from here at 8.30 am and I am writing this on Monday night Jan 31st to catch the post tomorrow for Dear old Australia. Sometime between January and March the three brothers were reunited. Percy and Bill tried to get a transfer to the 12th Bn. so the three of them could serve together. This was the last time they saw Claude. The attempt to join the 12th Bn came to nothing and on 15 March 1916 Bill and Percy were on the train to Alexandria with the 26th Battalion to join the BEF bound for France. The Battalion had been re-organized and equipped in Egypt and embarked on the Northrand on the next day. Perce had time for a brief note before he left. Just a few hasty lines to you hoping you and all are well as this leaves Bill, Claude & myself. Well may Dear there are a few views of Cairo that I had in my bag So I am sending them home for Keith & Lionel & give a few to Arthur. I hope that you will like this. I thought it nice. I expect you see plenty like this at home but it is from France so that makes all the difference. The present is what I bought out of the money that I got for the 1/4 mile race. I did not do any good at the Brigade sports as it was to soon after the first race and I was stiff & sore not having any training for them at all. The first was on Friday & the second on Sunday. So you can see that they were to close. Well Dear Bill is well & I got a letter from Mr Hurst last night. I hope you will like the present. The handkerchief is sent to you from a French lady were we go to. She is very nice & kind has two little girls, one in arms & the other about 6 years & her husband has just been killed on the Somme. We get her to do our washing & cook meals for us to help her but she is so obliging nothing is any trouble to do for us. Bill & myself & a young chap name Bill, related to the Crosses at the Hotel on the wharf, go about together otherwise we are chums. I expect you wonder how we get on to understand the French people but I speak a little French & people here speak a little English. So with one & the other together we compree (understand). Well Dear don't get jealous of the poor little French girls as they are not art galleries. There is nothing like the Tassy girls anywhere. So don't worry on that score. Don't you think this pretty? This is a chateau in France it is the name they call a mansion. There are just lovely nice trees & grass & lakes & flowers just lovely to rest in on a hot day this particular one is 700 years old there is 2 views of it. Note the Sundial on the front you can tell the time of the day by the Shadow of the Sun. The idol is a crucifixion nearly every house in France has one. Farm houses too. This is a church that we passed as we were marching through a town a lot bigger than Dear old Hobart but not at good. His first action was in front of Armentiers where they remained until June. Just a few lines to you & the children hoping you are all well as this leaves Bill & myself. NOTE: This card bears along the side the signature, A.C. Anderson Presumably an office responsible for censoring letters. A few more lines to you hoping that you and all are well as this leaves us. Well Dear you say you will have to give up the Garage. I am sorry you have to but I must leave everything to you for the best. But take care of my kit of tools as I have Box Spanners and things that I would not like to lose; and the Sign Boards. Don't forget I am Sending you home a nose cap of a German Shell & a few souvenirs if I can get them through So keep a look out for them. These cards are of a place here close to were we were fighting but taken before the war. It is different now. Well Dear don't go to Foster about the car; let the Hobart do any business through Mr. Butler of B.M&B but on no account take under £80. See Mr. Hartam and have a talk to him & don't forget the insurance See Mr. Butler about it. Give him the policy. Percy's tonsillitis flared up briefly in June but he was recovered in time to go when the Battalion was transferred to Messines in July where they encountered gas. Bill seemed to be badly affected. After the battle at Messines they moved to the Somme. The great battle on the Somme began on 1 July 1916 but the AIF were not involved until the third week with attack on Poziers. Claude, who was still with the 12th Battalion, was killed on the first day of the major assault on 23 July 1916. He had arrived in Belgium in April and went into the front line in late May. When the Somme campaign began they were at Outterstem and between the 12 and 20th July they marched in 5 stages to the Somme front near Albert. On 22 July they moved to the front in the northeast corner of the village of Poziers. The next evening Claude was killed as his Company positioned itself on the battle-line. In this battle the AIF Division lost 5285 men in 4 days. 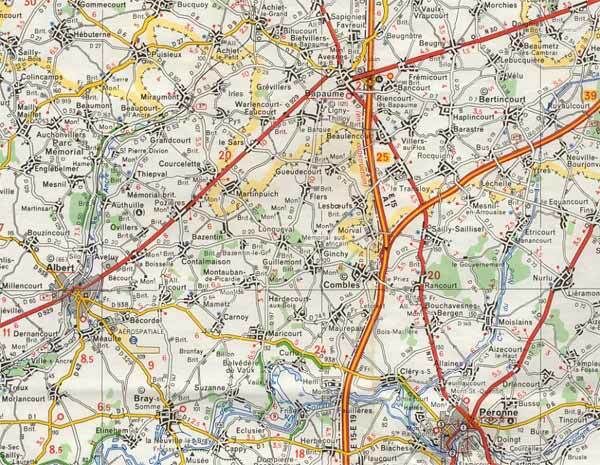 Percy was quartered at Vignacourt near Amiens for a few days then moved up to Warloy, a few miles from Albert. 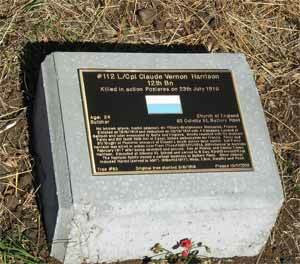 Eleven days after Claude's death Percy and Bill joined the fighting for Poziers. In the fierce fighting his 4th Division suffered 6848 casualties. In fighting 1 mile of front at this little town 23,000 Australians died. Unaware that his brother had been killed at Poziers, Percy wrote four more cards to Mary from the battlefield. Just a few lines to let you know that I am well; hoping that you & the children are all the same. I seen Bill today; he is alright, but I have not seen Claude for a long time now. He has had a change with his battalion and they done well they drove the Huns back & took some little French town. Well dear I have had no letters for a long time now but I have not given up hope as you never know your luck. Tell Keith that I will send him home a German helmet as soon as I can. I sent you two parcels; I hope you like them and I have some nice post cards but they will not let us send them. If they do I will send them as soon as I get a chance. Bill had been shot in the hand on 27 July and was sent to hospital in Wimereux, a small coastal town, and a few days later to Boulogne. Percy was twice wounded with shrapnel in his knee on 12 August and again a week later. 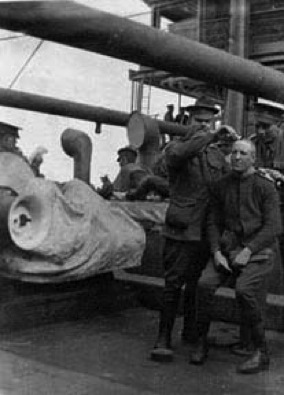 Percy returned to duty on 13 August and Bill nine days later. During August the King reviewed them at Warloy. To recover from its losses the 26th Battalion withdrew to be reconstructed but the Army was very short of men and rest was brief. The Battalion was rushed back to Poziers to dig a jumping off trench behind Mouquet Farm under heavy German shellfire. Casualties were high, the Commanding Officer Col. Ferguson was killed. They then retired north to Steinworde in Belgium for several weeks’ rest before returning to the line in a sector of the Ypres salient. From there Percy sent four cards to May. Just a few lines hoping that you & the children all are well as this leaves Bill & myself. Well dear I got your letter of Aug.17th also one from dear mother written before she got the heartbreaking news but I hope she has got over it now as it is for the best but you can guess how hard hit I was. I just lay down on the ground for half an hour and had a good howl. But I have avenged him & very soon after they got him. Poor old Horne Ripper, it hit him as hard as me, but I told you in a letter all about it. Bill is well now, quite recovered from his wounds, so every thing is alright. You say that Doll is very ill. I hope she is well by the time you get this, if not sooner. Well dear you ask if I would like to be home. You bet. I would walk all the way if I only could. But now I am here I would like to see the end that I am sure is very close now. So you can expect the best of news any day and you bet it won't be long before we will be home. Well darling I am sending a parcel and you ought to get it before this reaches you. I hope you like the contents. I wrote and told you about it & the contents. I hope you like these cards as I thought they were pretty. Well dear remember me to dear old Dad & Mum & all there to cheer up. We won't be long now. Tell dad old Paddy Laughton is not back yet; they say he is in a London hospital. The Battalion returned to the Somme at the end of October and was billeted in Dernacourt between Warloy and Albert. Living in leaking barns in cold and wet weather was an ominous overture. The winter of 1916 on the Somme was considered to be one of the coldest and wettest on record. Roads disappeared; trenches were feet deep in mud and water, men and horses drowned in mud. More than 50,000 allied troops were killed in one day; the battle was ended only when snow fell on November 18. The Battalion intelligence report and C E W Bean told the story. 4/11/1916 (Night) Moved to Carlton Trench and the switch trench. 5/11/1916 On arrival at Cobham Trenches one company and portion of D Company were ordered by GOC to take part in the attack on the centre of the battalion sector having one Company of the 27th Battalion on the right and one of the 25th Battalion on the left... under the command of Lt. Col. Walker CO 25th Battalion." 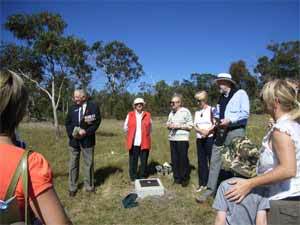 Due to the failure of one of the battalions to reach the assembly position the Tasmanian Company of the 26th Battalion and a few others were called in at the last minute to take the place of the missing 25th Battalion. They hurried up in daylight and reached the assembly place just in time to attack at 9 o'clock. The men were fatigued, as they been marching all night in the rain and mud, which in the trenches was waist high. The Germans held a very strong position in the system of trenches known as the Maze, and that proved impregnable against all attacks up to that time and afterwards. The specific objective was the Bayonet Trench held by the 4th. Division of the Prussian Guards who possessed a splendid reputation as first class assault troops. The attack was apparently anticipated by the enemy, and soon as the men got out of the trench they were met by a curtain of machine gun fire, that proved disastrous to the attacking forces, who only gained a few yards of ground and were compelled to dig in. Heavy casualties were suffered, but the Battalion had to hold the position until the following night. 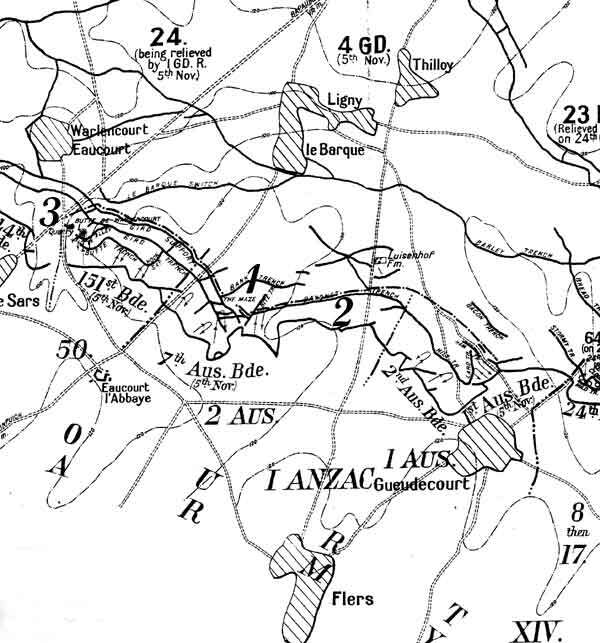 (Bean p. 89) The adjoining Battalion reported that the barrage was very light and the conditions atrocious yet a few of their men at some of the 26th reached and entered the Bayonet Trench and held it for a short time. "The attack took place after an effective barrage but the leading wave had trouble keeping up with the barrage for the first fifty yards on account of heavy going on the ground and also through the men having so much mud on their boots. On the morning of 5 November the enemy came out in strong force to counter attack and about 15 of them managed to get in on our right flank in front of part of the line that was not connected. He got close enough to throw a few bombs but as we had a Lewis gun in position to sweep the open space we were able to drive him off. Our men at the ... rose to the occasion splendidly with their rifles and a good many of the enemy were left dead and wounded when they retired. Shortly after being beaten back about 10 Germans gave themselves up. Our casualties for the sector during the counter attack were about six. On the morning of the sixth the enemy showed himself again about 4 am but in small numbers and was easily dealt with. The Lewis guns did very good work. The communication cable had been cut and only flag and runners were available to signal with. Percy had one of the Lewis guns and was shot by a sniper during the attack. A comrade Private J.E.Manning of 16th Platoon in D Company was with him. "I knew him. His name was Percy, but we called him Pat. He was on the L.G.T. (Lewis Gun). He was thin, fairly tall, dark. I saw him sniped at Flers on November 5 1916. I was in the same shell hole with him. He had been sniping with the LGT and was spotted and shot dead - clean through the forehead. We buried him and 5 others (whose names I do not know) in a shell hole out in 'no man's land' in front of Fritz's line at Fleurs. I believe the Pioneers put up one cross on the grave with all 5 names on it. but I didn't actually see the cross. His brother (William) was sent with a bad heart back to Australia. Before he left he asked me about Pat, but I didn't like to tell him owing to his heart, and so I said I supposed he was alright." "On the 5th November '16 we charged in front of Fleurs. Harrison belonged to the Machine Gun section and in the charge was only a few yards away from me. When we were crossing 'no man's land' a bullet passed through Harrison's head, killing him instantly. The attack was a failure, and we had to retire. Unfortunately we were enfiladed by 'fire' and although we wanted to, it was impossible to bring in the bodies from 'no man's land' and bury them. Three weeks later, the same ground was won from the Germans by the Argyle and Sutherland Highlanders and the Seaforths, and it is just possible that they secured the bodies and buried them. But I cannot say, and think it most probable that Harrison was never buried." Bill was apparently unaware that hi second brother had been killed (May was not advised until mid way through December). On 11 November he was back in hospital at Cayeux with bronchitis. He had been affected by the gas attack at Messines and on 26 November he was evacuated from Etaples to England. He spent some time at the Colchester Military Hospital. Here it was decided that his heart condition and the effect of the gas shelling rendered him unfit for further fighting. By now it was known that two of his brothers had been killed in recent months and this may have influenced the decision. In February 1917 the HS Karoola carried him back to Australia. He was discharged in June. Tragically Bill’s youngest brother Gilbert,who was just 13, died two motnts later. In the five months of the Somme battle over 400,000 allied troops were killed and many more wounded and incapacitated by the appalling conditions; German losses were about 180,000. The allies gained a strip of land 20 miles long and 7 miles deep, none of it of any strategic importance. General Haig's objective was to grind down the enemy force yet his army lost twice as many men. Claude was killed at the beginning of the AIF's involvement and Percy within two weeks of the end. The Russian Revolution freed Germany from fighting on two fronts and facilitated a major offensive in 1917. The site of Percy's death was fought over during the German advance and again as they retreated in 1918. It is unlikely that the War Graves Commission recovered his remains. He is probably amongst the 18,000 Australian dead with no known grave, however if he were buried in an unnamed grave it is most likely to be in AIF Grass Lane Burial ground at Flers. The nearby British Warlencourt cemetery at the foot of the Butte of Warlencourt is another possibility. The German Maze defenses were based on the Butte and on a visit to the area one seems drawn to it. Mary received his effects, and later a memorial plaque and victory medal. By registered post she got his wallet, testament, pay-book, diary, two notebooks, writing pad, pen, pipe case, brush, steel mirror, two French books, two badges and some photos and letters. From February 1917 she received a pension of £4.3.0. per fortnight for herself and the three boys. In 1921 she wrote for the forms required by the War Graves Commission. In her first request she asked for the Star of David to be inscribed above the words. Perhaps she was thinking of her marriage at St. David's Cathedral and did not realise its religious significance. The error was corrected and she wrote a new inscription and a cross above. Butler, McIntyre and Butler executed his will and the Loyal Raglan Lodge I.O.O.F. paid out his friendly society account. Percy had written the will a week before he left for the War. In it he appointed Cahrles William Butler his solicitor and Alexander McGregor, merchant executors and they were instructed to establish a trust fund from the proceeds of his estate should he die. When the will was proved in march 1917 the nett worth was £331. In the five months of the Somme battle over 400,000 allied troops were killed and many more wounded and incapacitated by the appalling conditions; German losses were about 180,000. The allies gained a strip of land 20 miles long and 7 miles deep, none of it of any strategic importance. General Haig's objective was to grind down the enemy force yet his army lost twice as many men. Claude was killed at the beginning of the AIF's involvement and Percy within two weeks of the end. Tragically the family’s loss did not end there for Pat and Sophie’s youngest son, Gilbert,13, died in Hobart less than a year later. 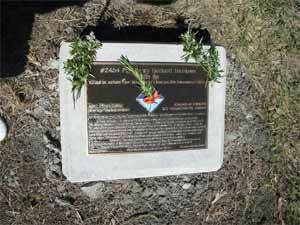 Percy’s name is inscribed on three memorials in Hobart. On the Cenotaph on the Domain, in St David’s Cathedral where he was married and with his brother Claude in the family church, St Georges on Battery Point. Along the river side flank of the Queens Domain two rows of cedars were planted on each side of a path known as Soldiers Walk. 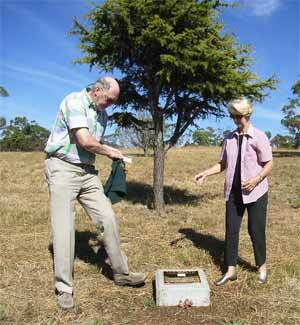 Tree number 168 was dedicated to Percy and number 83 to Claude. Percy’s tree is in the outside row on the western side of the Walk and Claude’s in the inner row on the same side but 462 yards south. After Percy went overseas May moved 171 MacQuarie St above Harrington St. opposite the Dispensary and, following his death, to 45 Colville St Battery Point. From about 1920 she also accepted responsibility for her own three sons and for four of her brothers. She lived at this address until 1924. Her mother Maria continued to live in Bathurst St. until 1917 when it seems that she moved in with the recently widowed Mary. Although she was unaware of it, when Mary married Percy she acquired the same name as her maternal grandmother.